It isn’t even December yet but already, stores, malls, and houses are showing the holiday spirit and decking out their walls and windows with Christmas lights and decors. Christmas decorations are a beautiful sight but without taking the right safety measures, they can also cause fires and other accidents. Here are some ways you can stay safe during the holidays. If you’re buying a new artificial tree this year, check the box or ask the salesman if the tree is “fire resistant.” This doesn’t mean that the tree won’t catch fire if a fire breaks out; it simply means that it will be more resistant to burning and won’t enlarge the blaze immediately. When placing the tree inside your home, make sure you keep it in a corner away from the door and other areas where people in the household might accidentally walk into it. Do not place Christmas candles or any other sources of fire near the tree (or any other decorations for that matter). If you are reusing last year’s Christmas lights, inspect the wires and make sure that none of it has been damaged by rats. Check the lights for any broken or cracked sockets, loose connections, or bare wires. Replace any damaged bulbs immediately. Never pull on the Christmas lights as this will add stress to the cords and cause it to fray or break. When using extension cords, tape them to the wall so that nobody accidentally trips on the wires. Make sure you do not plug too many lights or other electrical appliances onto the cord if you intend to use them for a long time; extension cords can burn if they are overused. Finally, make it a habit to see that the Christmas lights are switched off before heading to bed. Candles add warmth and holiday cheer to a room, but they can also be a source of accidents as well. As mentioned earlier, do not place lit candles near the Christmas tree or any other decor where the candle’s flames might reach it. 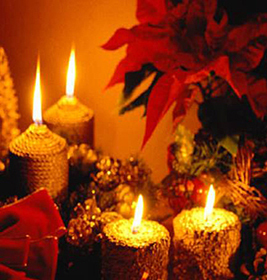 Place all candles out of reach of children and pets, and use non-flammable holders. If you are going to light any Christmas candles, make sure you are within eyesight at all times. If you have toddlers and other small children at home, do not use Christmas decorations that resemble candy because they will be tempted to see what they taste like! Do not use decorations with small removable parts either; children have a habit of putting things into their mouths and they could easily choke on small parts.